Life cannot be just about organizing, striving and deep thought—a girl has to have some fun, too. If you’ve got a few moments to spare and a computer handy, here are some fun quizzes you can take online. You can take quizzes on the sites below without entering any personal information—as with anything on the Internet, use caution when visiting unfamiliar websites and always be careful what personal information you disclose. Beliefnet.com has quite a few quizzes of varying degrees of seriousness—I took this one to find out what kind of traveler I am. Gretchen Rubin’s Happiness Project site is full of interesting happiness-related content. Here are two quizzes to help you increase your happiness: How Well Do You Know Yourself? and What's Your Personality Type for Play? What are your favorite online time-wasters? And I’m dying to know: which Jane Austen heroine are you? What fun! Toxic Viper, huh?! Sounds pretty serious! I'll let you know what mine is if I get over there. Funny you should mention spending/wasting time on the internet. I've been doing quite a few searches on 'Word of the year 2012' because I really like the practice, but sort of feel alone out here in California. So I stumbled on a sort of a class that will provide prompts and suggestions for activities throughout the year. It costs about a cup of coffee per month, but I thought it might entertain me and I'd do more 'with' my word this year. I just sampled a little of the stuff posted for January last night. 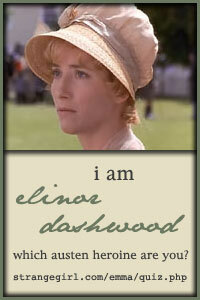 I'm Elinor Dashwood too - I knew you and I had a lot in common! Trouble is, I haven't read Sense & Sensibility, so I don't know if that's good or bad. I guess I'll just have to read it to see. And I guess I'll have to check out some of the other sites you refer to as well. Danielle--Captain Wentworth is more appealing than Elinor's beau, I have to admit. I also spend a LOT of time on book-related internet stuff...whether it's blogs (thanks for the mention on your blog, by the way! ), my library site, Paperback Swap or Amazon. So addicting! Then I end up purchasing or buying far more books than I actually have time to read. Oh, well. I guess it's a fairly harmless addiction! Claire--I think it's great that you're seeking support in your word of the year activities. I'm going to check out the site you mentioned. Hope you write about your experiences on your blog. Cheryl--Yay! Now you'll have to read Sense and Sensibility--I might reread, as I haven't read it in years. Come to think of it, I'd like to reread most of her novels. I've read Pride and Prejudice many times as it's my favorite, but maybe it's time to revisit some of the other ones. As someone who loves Jane Austen reader, I felt compelled to take the quiz! Elinor Dashwood here. I must say that Toxic Viper sounds quite dashing and edgy. You'll have to design a logo and costume now..